The sett was confirmed and entered in the official Scottish Register of Tartans after design archives were researched by the respected authority on tartans, Keith Lumsden. It has received the chief's endorsement. 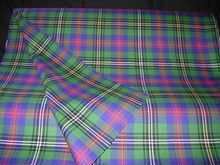 Woven in the Scottish Lowlands,this finest 137cm (54") wide Lightweight cloth is a favourite for trousers, ladies' skirts and kilted skirts, neck ties, sashes, headwear and so on.. Use it in the home for curtains, furniture coverings and bed throws. If you are not resident in the United Kingdom, the PayPal system will automatically show the price in your national currency before you submit your payment. For a quick check, use: http://www.xe.com/ucc .